Head west from Orlando to the glorious Gulf of Mexico. After lunch at Clearwater Beach, you will cast off for an afternoon of fishing and fun. Journey up to ten miles into the azure waters Gulf of Mexico to fish some of Florida’s most productive natural reefs . Being that Florida is the sport fishing capital of the world, you must take advantage of this excellent opportunity. Cruise the pristine waters of Florida’s west coast in search of Tarpons, Jacks, Groupers and Snappers and perhaps even a shark (or at least that is what you can tell your friends!). Whether you’re an avid fisherman or want to enjoy the day with your family this deep sea fishing trip can accommodate all your needs. Equipment is all included and for those who aren’t sure how to use it their staff will be more than happy to show you. This excursion runs in conjunction with the Clearwater Beach Tours, enabling keen fisherman to head out to sea while the rest of the family relaxes on the beach. Enjoy a 4-hour fishing cruise aboard the Super Queen, the largest catamaran fishing boat on Florida's West Coast. Journey up to 10 miles into the Gulf of Mexico and fish some of West Central Florida's most productive natural reefs. Your Deep Sea Fishing excursion includes: Round-trip transportation from Orlando to Clearwater Beach; lunch; Deep sea fishing cruise; Rods, bait, tackle and license. 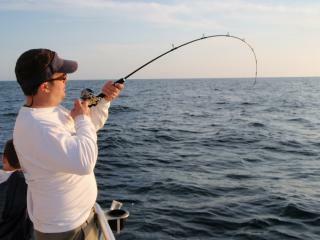 The Deep Sea Fishing tour departs Mondays Wednesdays throughout the year. The tour picks-up from central locations in the International Drive, Kissimmee, Lake Buena Vista, Disney areas. You will need to make your way to the nearest pick-up point which will be detailed on your ticket voucher. The Deep Sea Fishing Excursion is a full day tour, departing from Orlando at roughly 8.30am and returning from Clearwater at around 7.30pm. Pick-ups begin at 7.30am and transfer time to Clearwater Beach is around 2 hours each way.